It's always tricky to combine learning with fun, but especially difficult when it comes to learning about the bible. While Jack Thompson rants against video games for being "immoral" and "unacceptable" and "killing his family," a few companies are trying to put the hand of God back on the controller. Not surprisingly, we found that devout fundamentalists often make incredibly bad game designers. A little less expected is their muddling of the message of the Bible. We take a look through six of the most preposterous religious video games, evaluating them on sheer ridiculousness, as well as biblical coherence to answer the ultimate question: What would Jesus play? Suppose you own a Super Nintendo, but the 16-bit graphics have too many rounded corners and smooth surfaces for your eyes. Also, imagine that your idea of a fun game involves taking an existing PC game about shooting nazis, and reskinning it so that you are throwing fruit at animals that puts them to sleep. Having a difficult time imagining that? 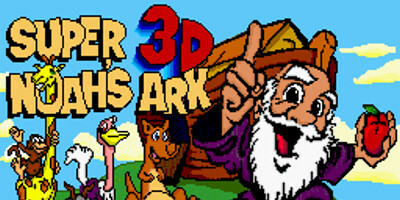 Well, then you'll have a hard time imagining why anyone in their right mind would buy Super 3D Noah's Ark. 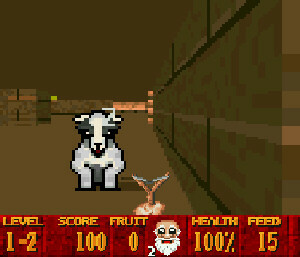 Hell, we had a tough time even imagining why ID software would let a company like Wisdom Tree take over Wolfenstein3D, the grandpappy of all first-person shooter games and transform it into ... well, just a random grandpappy running around tossing melons at sheep. Nor, can we readily fathom what Wisdom Tree was thinking here. Not only do you have to fictionalize the whole Noah throwing fruit at sheep trope--one apparently omitted as being too boring for the bible--but you also have to pass over about a million Bible stories that lend themselves to being Wolfensteined instead. Not only did the folks at Wisdom Tree make a bad game, it also appears that they have never read the Bible. For instance, it has Noah shooting fruit at an ark full of 100 sheep. Isn't the ark supposed to have two of each animal? Hell, you could have just seen Evan Almighty and known that. This game offers three Wisdom Tree games for the price of one, which makes it an even worse deal somehow. 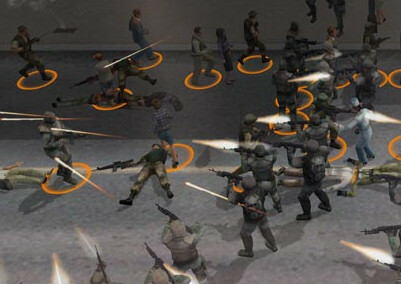 After all, seeing what they do with a 3-D shooter, really, what could be better? Answer: Pretty much everything above having your scrotum chewed on by a Rottweiler. What you're really getting here is three lame versions of the same incredibly bad game: Guy carries random crap across the level. 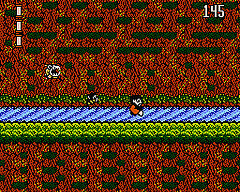 Basically it's Super Mario Bros. if there were no villains or coins or anything other than pits to jump over. 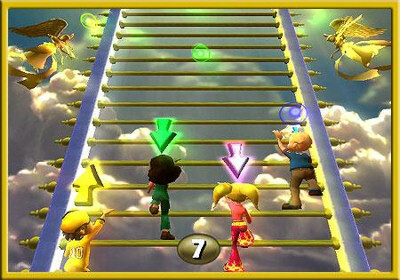 In Noah's Ark, you guide Noah on his famous run through the jungle, lifting animals over his head, and carrying them back to the ark-trash-chute. 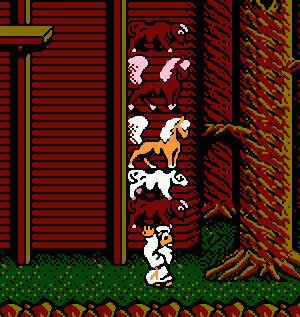 You can even stack the animals into a big animal dagwood sandwich, although sadly, you can't eat them. 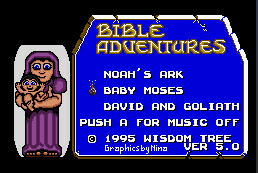 In Baby Moses, you lift Moses over your head, and carry him to the end of the level, where presumably, he is tossed into an ark-trash chute, off screen. And finally, let's not forget David and Goliath, which is a complex gladiatorial combat game that both entertains and connects to the Biblical story. Just kidding! No, actually David and Goliath is a game where you--surprise!--lift sheep over your head and carry them across the level to an ark-trash-chute. There's no passage in the bible that says, "And thou shalt lift lots of animals over your head and carry them to Jerusalem." 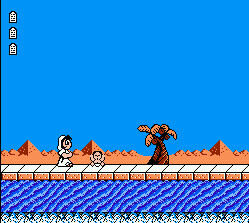 Also, the way you lose in the Baby Moses game is by dropping Moses in the river which feels a little morbid for a game that is presumably aimed at children. Not only have you just drown a baby, but you've doomed the Jews. Nice going, kid. Huzzah, another three-for-one deal, and the shittiest of all, from Wisdom Tree! They must have had someone contact their company and say, "Your games are unplayably bad, but you could fit more on a single cartridge." The Wise Men lets you control Akbar the Spitting Camel as he runs through an uninspired 2-D desert of platforms and cacti, on his way to visit baby Jesus. But you also get to stop to answer totally unrelated questions about the Bible! 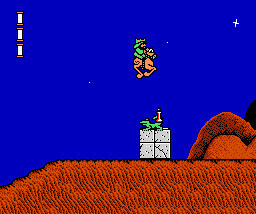 The second game is called Flight to Egypt, and is basically like Donkey Kong, only instead of controlling an ape (we're guessing that concept brought humans and apes too close for creationists liking), you play an actual donkey. 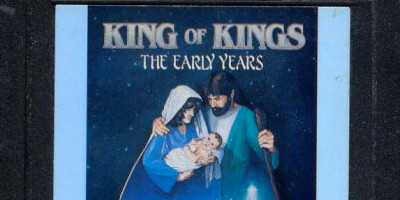 Your job is to carry Mary and baby Jesus along some kind of blue scaffolding while being attacked by snow and at least one crawling ice cube. Careful, gamer! If you let baby Jesus die before he can preach his message, Christianity dies with him and all of humanity is doomed! 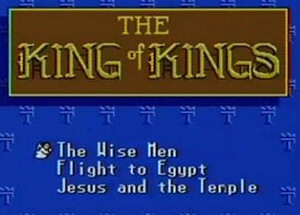 The last game is Jesus and the Temple, which is basically a timed run for the big J-bird in the sky to get to the temple. It may as well be Saddam and the Grocery Store though, since you're just running across some ground trying not to fall in the water. This is probably the worst representation of His message in the Learning Tree pack. The obstacle that Jesus needs to jump over in Jesus and the Temple? Water. If only Jesus could WALK ON WATER. 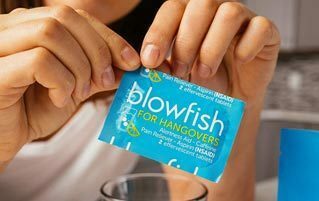 That would be handy. Welcome to the big leagues. 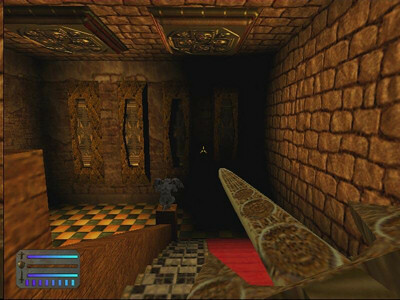 Far from Wisdom Tree's crappy cartridge games lies a modern high-budget PC game based on the Left Behind books. For those of you unfamiliar, here's the basic premise: All the good people get raptured up to heaven. 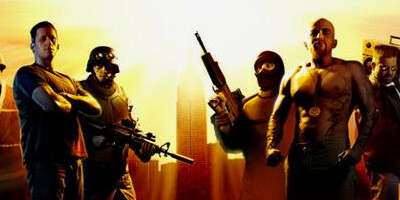 The not-good-enough people are left on Earth, where they have to battle the forces of the Antichrist. The game is of course in no way fun to play, but it is remarkably true to life in terms of some details of fundamentalist Christianity. For example, you go around trying to convert people to your way of thinking, occasionally killing them if you can't. Men are more valuable than women because they can build buildings. And the minions of the Antichrist include electric guitarists, members of a world government (un)surprisingly similar to the UN, and "Secularists." Basically, if you aren't praying to Jesus, you're the enemy. How's this for a mixed message: The multiplayer mode of the game actually lets gamers control the forces of the Antichrist, brainwashing believers with their secularism and electric guitars. Presumably the "win" screen for those players depicts them roasting in Hell, so it probably comes off as something of a hollow victory. Ever since Vatican II, the church has tried to promote a lighter, more fun, atmosphere. 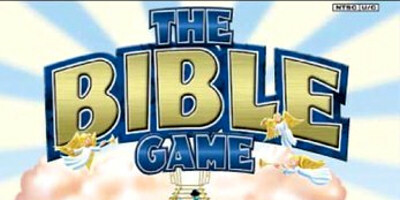 So, it sort of makes sense that the Bible Game is a big Christian game show. 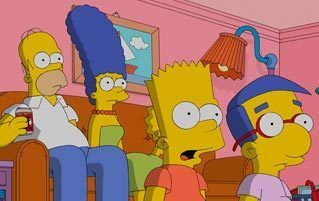 The two losing contestants are presumably sentenced to Hell. As you pick spaces on the board, one of a few things can happen. 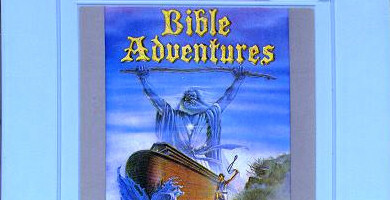 Maybe, you'll get Bible Trivia, which requires all players to answer questions about the Bible. They aren't simple questions you might be able to answer, like what commandment rhymes with "Thou shalt not shmurder." No, you can expect to be asked things like "When Mohab went unto Mohob, how many days was it before he left for Mohib?" But wait, there's more! 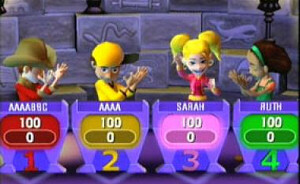 In addition to the trivia, you can land on a fun challenge mini game! As you try to pass through rings while riding the waterspout of a whale, you might wonder what possible connection it actually has to the Bible. The only whale-related Bible story we can think of is the one with Jonah getting eaten by one. 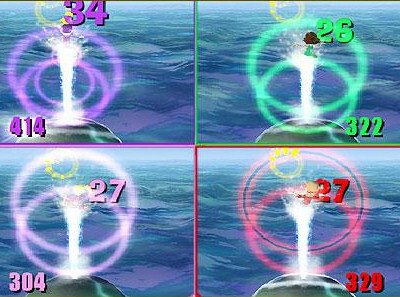 Actually, a mini game where you have to climb your way out from inside a whale sounds kind of awesome. And, when it comes to fun, what simulated activity could be more exciting than climbing a ladder? (Hint: Pretty much anything else). These games are enhanced by the fact that the host says "Let there be light!" to start each one, which combines with the bad Christian rock soundtrack to give you the sense that they're actually trying to be hip. Best of all, when you pick spaces on the board, you can randomly get the "Wrath of God" spot, which instead of laying waste to the Earth, takes all of your points. Winning the game requires knowledge of a bunch of obscure bible trivia, constantly completing bizarre mini games that seem to be pointless rituals of repetition, and even if you do everything you're supposed to, God can randomly take everything away from you. In other words, it's just like being a devout Christian. 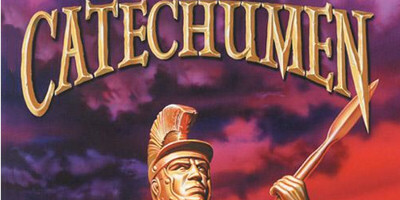 The word "Catechumen" is defined by Merriam-Webster as "a convert to Christianity receiving training in doctrine and discipline before baptism". 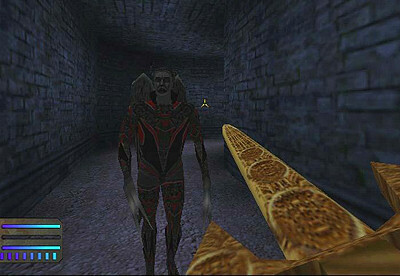 But the game Catechumen is defined as "A first-person shooter that attempts to be Christian by making the enemies demons." By that logic, Doom was a more Christian game because it had you killing way more demons and gave you much better weapons to do it. See, in Catechumen you don't kill people with guns, because that's the act of an unholy person. No, you kill them with your sword, and your other sword, and your magical sword, and once you find it, your extra-powerful sword which is like the one God probably uses. 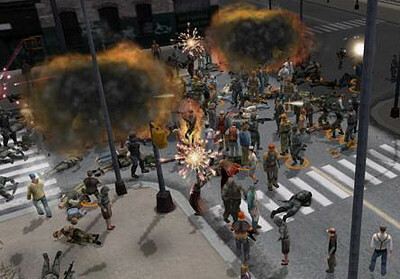 Basically, this is your typical first-person slaughter fest with a tiny religious hat on. This reinforces the recurring theme of this list, which is that religiosity and fun exist at opposite ends of the spectrum and that you pretty much have to choose between one and the other. That can't be true, can it? 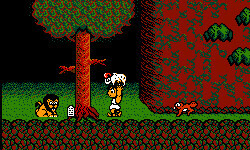 Isn't there a story where Sampson kills an entire army by bludgeoning them with the skull of a dead animal? Where's that game? Fighting and killing Roman soldiers and demons isn't particularly Christian, any video game protagonist can do that. But, leaving a swath of bodies in your wake and claiming that you are a moral person because you did it with a holy sword and not a gun? All you have to do is add the option of letting them convert, and you're running your own Crusade.